You will feel chic in this vintage inspired, one piece knit romper! With its cross-styled bodice and flattering neckline you will feel fabulous each time you wear it! This sewing pattern will help you create a cross-bodice romper with a deep v or cross yours over for more coverage. 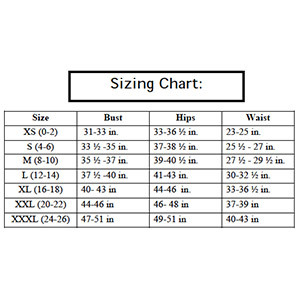 It features a gathered, elastic waist and can be made with or without sleeves.There are four sleeve length options: sleeveless, short sleeves, three quarter length sleeves or long sleeves and the shorts come in three lengths: 4”, 6” or 8” inseam lengths. 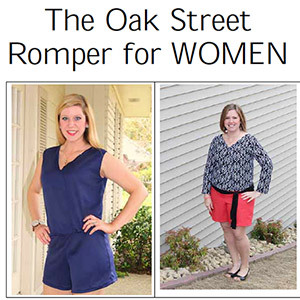 The Oak Street Romper can be made with your favorite knit or similar stretch fabric for the top (bodice) of the romper such as cotton jersey, medium or lightweight knit, poly, poly blend, lycra and the shorts can be made of knit or woven such as voile, seersucker or similar! Imagine the shorts in a vibrant, graphic-printed fabric paired with a jewel toned top or keep it basic in a black or navy. Show off your summer style in a coral or turquoise and hit the beach (or your errands) in style! This pattern is available in XS to XXXL. Suggested fabrics are cotton spandex, ponte de roma, and cotton jersey.